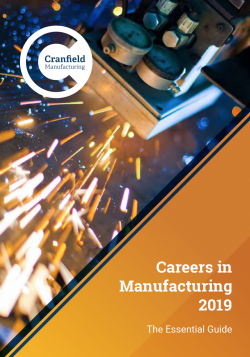 Cranfield University has recently published The Essential Guide to Careers in Manufacturing 2019 to provide inspiration to graduate engineers on the variety of job roles and progression routes in a rapidly changing graduate market place. The latest ‘Jobs of the Future’ report forecasts 142,000 new jobs in science, research, engineering and technology from now to 2023. Growing twice as fast as other careers, this pool of jobs is being fuelled by the pace of infrastructure investment and digital innovation, with a highlighted shortfall in engineering of 40%. As indicated by the Financial Times, across the past five years, 145,000 manufacturing jobs have become available to the UK economy. So, with this growth in the sector, what job roles will inspire the next generation of engineers to the manufacturing sector? Engineering and manufacturing are certainly exciting sectors to be a part of at the moment. With growth in digital technologies, big data and industry 4.0, there are new and exciting career options where graduates can make a big impact. Protecting engineering IP, production and manufacturing system assets from cyber-attacks will take a combination of skills from big data, cyber-security – and understanding of engineering production systems. Additive manufacturing is an exciting field to work in, being fairly new and fast-paced. It also has great future potential and therefore attracts a lot of investment. Did you know that Engineering generates 23% of the UK’s total turnover (Engineering UK key facts 2018). Cranfield has opened the door to graduates by supporting them on their first step on the career ladder in their chosen fields. The guide shows some graduate job roles and the various stages of career development – so, if you are interested in exploring what your future career might look like across a range of sectors and roles – make sure you take a look! Here are some top tips for aspiring manufacturing graduates from a specialist in the manufacturing sector. Contact a local manufacturer to ask for a factory tour – most are very accommodating and you might be surprised by the range of roles available. Don’t follow the money – choose an organisation that offers genuine training, career development and an enlightened culture – the money will follow you in due course. Work experience is great way of understanding an industry first-hand – if your school or college cannot help, be proactive and contact a few local employers asking for an opportunity. Make your own decision – listen to teachers, parents and friends but by all means there are plenty of online resources available for you to make an informed career decision. If you’re considering a future career in manufacturing, click below to download the full report.